‎”We can only be said to be alive in those moments when our hearts are conscious of our treasures” ~Thornton Wilder. Wishing our POA friends and family a happy Thanksgiving! We treasure each and every one of you! Author adminPosted on November 22, 2011 Categories Editorials, UncategorizedLeave a comment on Happy Thanksgiving! POA recently fit Paralympic and WSF Para-Snowboard World Cup Champion Evan Strong with a custom NPS vacuum socket. Before he left, we gave the prosthesis one final check. Stan and Mike were enlisted to lift him upside-down while clipped into his boots and snowboard – our version of an “inverted aerial.” A perfect example of the power of elevated vacuum! To all the men and women who have put their lives on the line to protect ours, we honor you today. We appreciate your sacrifice and thank you for your service. God bless you all this Veteran’s Day and every day. Ronnie Dickson’s latest adaptive climbing video has just been published. Absolutely worth checking out! If you are on the fence re giving rock climbing a try, this will provide you all the inspiration and motivation you need! Click here to read the O&P Edge article. POA’s Bree McMahon continues to inspire and win the hearts of everyone she meets. 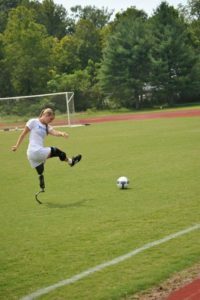 Two years after the high school soccer star lost her leg above the knee in a horrific accident, an Orlando Sentinel looks at how far she’s come – from being near death in the hospital to being back on the soccer field and training with a prosthetic leg. Click here to read the entire Orlando Sentinel newspaper article. An amputee for 48 years had been struggling with a pressure sore on his stump for over two years and had a staph bacteria almost to the bone. He used a mixture of sugar and Betadine, an old home remedy, for about a week and the wound has practically healed up! Click here to read the entire Orlando Sentinel newspaper article. POA’s Mabio Costa is now a certified instructor and member of the “First Swim” Clinic team! He has a gift for teaching and instilling confidence in his students. At a recent clinic in North Carolina conference he worked with a young girl who was terrified to let go of the edge of the pool. By the end of the session she was swimming unassisted. Way togo, Mabio! Click here to read the oandpbusinessnews.com article.